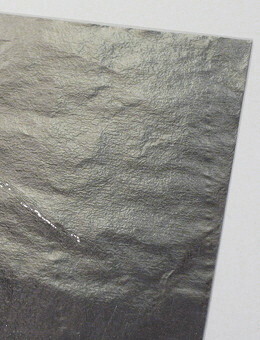 Close-up of 2.5 micron aluminum foil. The ribbon is the element where the actual electrical signal is induced, so it has a strong affect on the way Your microphone will sound. Ribbon is made of a strip of an ultra-thin aluminum foil. As thinner is foil, as higher output signal level You will have, as signal level is reverse proportional to the mass of a ribbon, but there are logical limitations. First, foils of 1.5 microns and below are very difficult to handle. Second, even if You try hard enough and manage to make a motor with such thin ribbon, the microphone is going to be extremely fragile, as even lightest pop or impact can blow the ribbon away, so You might end up in becoming paranoid about the possible abuse during sessions. On the other hand, foils of 4 microns and above are not a good idea, because ribbon mass is going to be too high for a good performance. The problem is not only in output signal level. The main issue with heavy ribbons is that they are tend to compromise the main feature that ribbon microphones have - a nearly perfect transient response. Ribbon microphones have many cons by their nature, so designing a ribbon microphone without the main advantages makes no sense. By the way, many of cheap ribbon microphones have ribbons made of up to 6 micron thick foil... In general, the best gauges to use are between 2.0 and 3.0 microns. The most most widespread option for ribbons is 2.5 micron thick foil, as it not that difficult to handle and it performs very well in motor assemblies. I offer 5.0" x 2.5" sheets of 2.5u Al foil for purchase online. Ribbons: narrow and short vs wide and long. After we have chosen the foil gauge, we have to decide on final dimensions of a ribbon. Its lengths is determined by the length of magnets used, so You should decide how long Your ribbon is going to be to choose and purchase appropriate magnets. 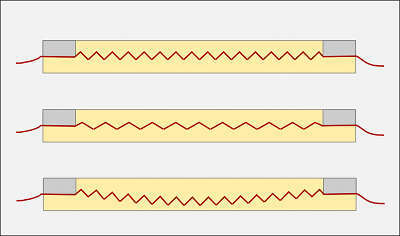 The most typical ribbon lengths are between 1" and 2". Of course, there are designs with longer and shorter ribbons, either, but it is good starting range to choose from. I would advice to go for a ribbon between 1 1/2" and 2" in Your first design. Through it is logical that length adds to the mass, it factually does not affect the signal level much, as when You increase the length of a ribbon, the length of magnets increases same way, providing proportionally stronger magnetic field. What really does affect the relation of ribbon mass to magnet strength is the width of a ribbon. Ribbon widths can vary between 1 mm - 6mm (0.04" - 0.25"), so the range to choose from is pretty wide. Again, when You half the width, the signal output level doubles. I have designed motors with down to 1.5 mm (0.06") wide ribbons and I can tell You, that working with such narrow ribbons takes huge effort, so I would advice something in a range of 4 mm - 6 mm (0.16" - 0.25") for Your first motor. The width of a ribbon is physically determined by the gap You leave between magnets in Your assembly, so You should decide on desired width when designing chassis. To turn the foil strip into a ribbon we have to corrugate it. Corrugation style and the tension of a ribbon both affect the sound of a microphone. I would define it such way: corrugation style affects the possible range of workable tensions, while the tension itself affects the sound. Corrugations add elasticity to a foil strip when a tension is applied to it, while the tension of a ribbon is one of the most significant aspects affecting the final performance of a microphone. As more tension we apply, as higher the resonant frequency of a ribbon raises, but high resonant frequency is undesirable, as it determines the typical low-frequency boost in the response of a ribbon microphone. The normal range for such boost (thus, for the resonant frequency) is between 40 Hz and 60 Hz. If it gets higher, You will experience the audible excess of bass - the microphone will sound boomy and woofy. A sheet of aluminum foil and a cutting instrument. The whole logical chain again: the tension determines the resonant frequency, but the possible tension range is determined by elasticity - as higher is the elasticity, as lower possible tension we can apply, while elasticity itself is determined by the corrugation style. When we talk about corrugation style we mostly assume the corrugation density, e.g. the amount of foil deviations per a certain length, usually measured in corrugations per inch. The most widespread density is around 20 - 24 corrugations per inch. I have tried different densities and can confirm, that this range can be considered optimal for 1 1/2" - 2" long ribbons. I have observed, that increasing the corrugation density usually tends to add more tension to a ribbon, thus raising the resonant frequency. On the other hand, decreasing the density can compromise the stability of the form - the displacement of ribbon angles from the central axis gets to high and ribbon tends to loose the form under its own weight. In general, for the optimal balance between the elasticity and tension, the angles of foil strip deviations should be around 90 degrees (when fixed on chassis). OK, You may already be tired of theory, so at last we pass to practical aspects. In this part I will describe how to work with aluminum foil and how to prepare a ribbon for Your microphone. I have placed this chapter before the chassis design, as I suppose that many will use this information in order to reribbon old or damaged mics, so when I talk about motor or chassis I assume that You have one to work with. For those, who intend to make their own microphone from scratch (like I do) - the chapter about chassis design follows this one. The first part is cutting. The foil is shipped in protective cardboard folders or something similar. 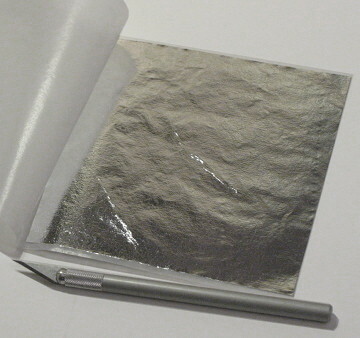 The foil sheet is sandwiched between two sheets of thin transport paper. There are different approaches to handling the material. I always cut the foil together with transport paper, as there is much more control this way and less chances to damage the foil (beware, it can be damaged with almost anything). Measuring is usually quite complicated, as foil tend to slip inside the transport paper, so I do as most DIYers - cut by eye. It takes some training, but it is not that difficult, as it might seem. Aim for required width, hold the linear and cut with one confident movement, don't mess slowly. Use very sharp instrument, otherwise the foil will tear. I use technical scalpel and change blades after each 20 - 25 motors, I just feel when it is time for a new one. When You have a strip, check its width against pre-made chassis. If it is wider then the gap - try again, but it shouldn't too narrow, either. The best result is when You can only see two tiny lines of light between the ribbon and the magnets. Remember, that the length will be reduced almost twice when ribbon is corrugated, so be sure that Your foil strip is long enough. I usually take 5" long strip when I need to make 2" ribbon. This way there is some excess length left, so if the foil gets damaged closer to one of ends You still can skip the damaged fraction. Even if it doesn't, You still have some extra length to choose the most appealing part to settle in a motor. 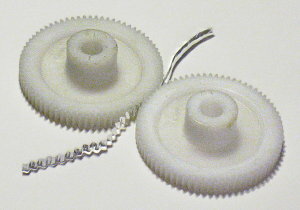 Ribbon corrugation using two plastic gears. The second part is the most tricky in my opinion - it's corrugation. I spoil most of foil during this stage. When I was beginning to deal with ribbon microphones it took me up to 5 - 6 attempts to have a motor ribboned, but now it is quite like opposite - I usually spoil one strip of foil when ribboning five motors. Again, there are different approaches to corrugation. Some people apply fluent liquids, like spirits, to foil before proceeding, but I do it dry. First, remove the transport paper. It usually sticks to foil a little bit, so be careful, no sharp movements - go slowly and gently. When the foil is free I lay it on a rib. Sound strange, but in reality such ultra-thin foil is factually quite stable, so when you position it as half-circle, the strip lays on the rib perfectly well. Now I lay two gears across the foil and grab the very end of strip with them. Here we go. Start rotating the gears very slowly. The ribbon will tend to swing up and down in the beginning, but usually it settles at some position after several millimeters of length are processed. You can hold an index finger a bit in front of gears to guide the foil, but do it extremely carefully. To be precise, it is not like "guiding". Just hold Your finger and foil will change direction itself, otherwise You are most likely to damage it. It takes some time to get confident. Keep going until You have all the strip through. As You probably noticed, it can stick to gears in some places, but it is easy to remove with felt sticks, like those that are sold in drug stores. Corrugation with gears provides the best result, but gears of appropriate dimensions and quality are quite difficult to find and they are pretty costy. Funny, but gear research was the biggest quest for me when I was gathering materials and tools for ribbon microphone works. Finally, I had to purchase quite a bunch, so I have them for sale on this site. For the case if You want to do it without gears, there is another option. You can use any kind of corrugated surfaces, like the rib of a camera lens. Put the foil strip over the surface and while holding it with a finger of one hand, use the same old felt stick to press the foil against the surface. I did it with a rolling motion all along the strip. This way leads to much more foil waste, as it is quite easier to damage it, and results are not that pretty, as after processing with gears, but still this is an option. Now the ultimate part. Ribboning. In general, there is not much to talk about, it is mostly about "feeling" the way, it can only be understood when done, so put Your patience together and get ready to try. First, place the ribbon in a gap and make sure that it can be settled comfortably. Then put the first clamp on, screw nuts on bolts (until they are all the way down, but not fixed) and use the outer tail to position the ribbon in a gap the best possible way (to have an equal space between the ribbon and the magnets on both sides). Now lightly fix nuts. You have one side pre-fixed, but be careful, You still can displace the ribbon if You make a wrong move. Get to other side and repeat everything as with the first clamp, but this time You have to set the tension together with position. Gently and slowly drag the ribbon outside watching it to keep good positioning in a gap. The correct tension is just when it doesn't bend down under its weight anymore. Just when it stays horizontal, not tighter! Speak or sing over the motor (I keep about 5" distance) and watch the ribbon moving. It should move freely all along the gap. If it touches the magnet (You can see it by uneven motion), correct the positioning. If it bends down again after You spoke, apply a little bit more tension. Repeat the procedure until the ribbon returns to clearly horizontal position after visible vibration. Fix the screws. Now recheck the position of ribbon in a gap all over its length, You might want to undo nuts lightly and to correct the position of ribbon on either side, but do it very gently and fix the nuts again. Now apply a little bit more tension to nuts. Note, that You should not use a screwdriver until the very end - tighten and untighten the screws with fingers. Check the appearance of ribbon again, try to speak, when the motor is in vertical position, rotate it, try different angles and watch the ribbon. In general, it should keep its form now. Apply all the tension to screws You can with bare fingers. Now it's time for a multimeter. 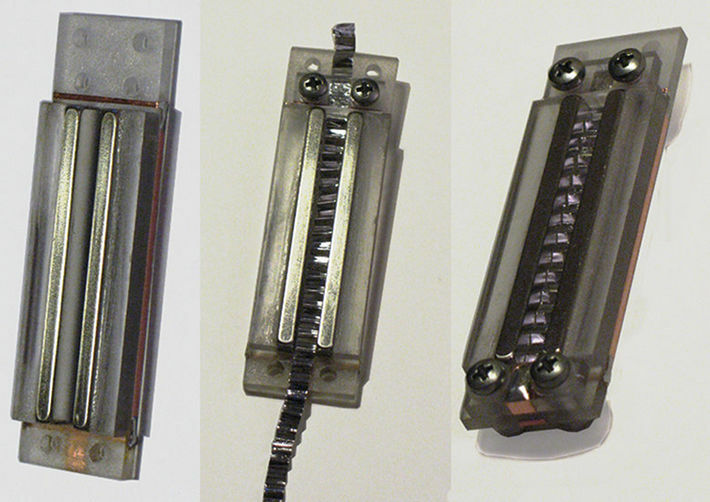 Set it in continuity testing mode and touch both contacts on a motor (corresponding to opposite sides of the ribbon) with probes, but be sure not to hold, as it can be bad for a ribbon, just touch for a short beep and release. 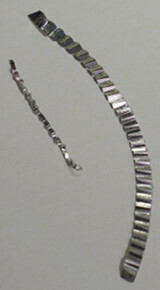 The ribbon should bend about half-way up or down when probes are applied and restore its position when probes are off. Now set the multimeter in resistance testing mode (in its lowest range) and check the value. In the best case, multimeter should read something in the range of 0.7 - 1.1 Ohms, but it can be higher now because pressure between the ribbon and contacts is not strong enough. Now set the multimeter in continuity testing mode again and check for the contacts between ribbon and either of magnets. It should be perfect zero. Check and recheck. If everything is fine, take the screwdriver and tighten the screws again, but don't apply force. I usually do just about half-turn more on each screw. If resistance reading was too high, check it again, it should be fine now. Well, if it is a bit more then it is supposed to be, like, 1.5 Ohms, try applying a little more tension to screws, but really, just a little more. Anyway, static resistance up to 1.5 Ohms is OK.
Voila! You made it! Connect the motor to transformer, plug into a preamp and enjoy. Again, it can't be stressed much enough - always remember to use the pop-filter, it is very easy to blow or stretch the ribbon with occasional pop. Have great recordings!